Blankets?, originally uploaded by indiaeden. After a huge de clutter of my fabric supplies the other week, I decided to treat myself to just a few yards of some fabrics I'd had my eye on for some time. This is one of them. Three yards of Anna Maria Horners Folksy Flannel, Forest Hills in Moonlight. 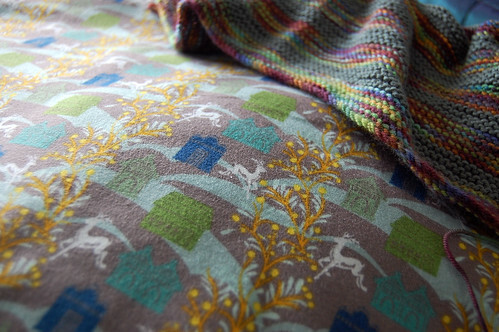 I love these colours, and look how well they go with the blanket I've been working on for baby. This fabric will be a receiving blanket, and possibly more,I haven't decided yet. I'm not finding it easy to balance my need to prepare for this baby, with my fears for this baby. Part of me so wants to let go of the pain, and fear and enjoy the process of sewing and knitting sweet baby things, while another part of me is paralysed with fear. I know doing these things can't kill my baby, but I also know I have a cupboard downstairs stuffed full of all the baby things I prepared for Florence. I wish it wasn't so hard. oh I've been eying up those flannels too but have so far resisted. That's lovely fabric :o)It looks really warm and snuggly. I'm completely in awe of how brave and forward-facing you're being!! When I was pregnant with Kiara, I didn't make anything for her at all, and all my friends were forbidden to talk about "When the baby comes....etc"
The fabrics look gorgeous, the way things are going on the knitting/sewing front I'm sure you'll have quite a lot done by the time this babe arrives! I love those colours - fabulous fabric ! !